The theremin: An apropos sign adorns the instrument at the Bakken Museum of Electricity in Minneapolis, MN, since it can only be played by not touching it.Courtesy Mark RyanAnyone who has ever watched a 1950s science fiction film has probably heard the eerie emanations of the electronic instrument known as the theremin. It’s that high-pitched wavering tone that usually accompanied radioactive giant insects, or flying saucers and spacemen (e.g. The Day the Earth Stood Still). It can also be heard creating the good vibrations in the Beach Boy’s song of the same name, I remember seeing Simon & Garfunkle in concert a few years back, and noticing that the instrument was used during the performance of their song The Boxer. I don’t remember when I first became aware of the device. I suppose it was in those aforementioned sci-fi movies. The electronic instrument (the first of its kind) was created by Russian professor Leon Theremin in 1917, when he stumbled upon it while trying to construct a better radio. Theremin was also a musician and obviously saw potential in his accidental invention. In this TED Talk performance (which got me interested in this subject), the above-mentioned Pamelia Kurstin shows that the theremin is not limited to just special effects. She has mastered the instrument to the point of being able to create dreamy and haunting melodies, as well as simulate a walking bass line as she does in the first song, Autumn Leaves. You’ll notice Pamelia appears to be in a trance while playing the instrument, but as she explains she’s keeping as still as possible so as to not corrupt the tone production. Unintentional body movements or even her breathing can affect the tone she’s trying to produce. 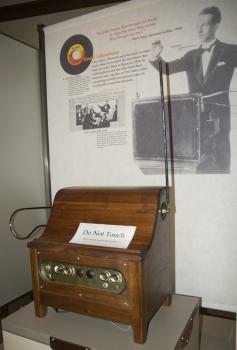 The Bakken Museum of Electricity in Minneapolis has a working theremin on display that visitors can play. Making sounds on the instrument is pretty easy but making music is a completely different story. Like the human voice, the violin, or similar instruments, the theremin allows for what’s called portamento, that is the gliding between a range of tones. You’re not limited by frets or keyboards, and have to sense your way from one note to the other. If you ever get a chance to play an actual theremin you’ll realize just how difficult it is. Most recognizable use of this instrument can be heard on The Beach Boys' "Good Vibrations"